But hey, on the bright side, today’s cable is a short one, and I’m mainly publishing it because it mentions several negative comments that Gemayel said about Sleiman right after the parliamentary elections in 2009 (Look for the sentences in bold at the end). The relevance of this cable right now comes from the fact that the two former presidents, Gemayel and Sleiman, have recently joined hands together and formed an alliance/rapprochement/agreement/gathering (I have no idea what to call it) that apparently seeks to create a unified bloc for the small parties represented in the government (although deep down we all know that this rapprochement is in fact a reaction to the Aoun-Geagea dialogue and an epic-fail tentative of a “centrist presidential campaign”). Hope you enjoy the cable. 1. (C) In a June 10 meeting with the Ambassador, Kataeb Party leader Amine Gemayel stressed that March 14 must be strong in opposing a blocking third for the opposition in the new cabinet, even if government formation takes longer as a result. He worried that some of his March 14 allies would be more “docile” in their dialogue with Hizballah. Gemayel said he would seek clarification from Hizballah on where its allegiance lies, and what its definition of sovereignty is. He believed National Dialogue participants should be chosen based on the number of seats each bloc received in parliament, with special allowances for under-represented confessions. He predicted that Amal leader Nabih Berri would once again be Speaker of Parliament, but thought it would be good to circulate other names for the position, to put Berri on notice following his negative role in the previous parliament. He also expounded on how the election results heralded the return of the Kataeb Party to its historical place of importance. End summary. 2. (C) The Ambassador, accompanied by EconOff, called on Amine Gemayel at Kataeb Party headquarters in Beirut June 10. Losing Kataeb candidate (Keserwan) Sejean Qazzi and a Kataeb notetaker also attended the meeting. Gemayel expressed his pleasure that March 14 had won such a solid majority in the June 7 elections, but he emphasized that Hizballah was still present on the ground, with forces stronger than those of the Lebanese army. This situation would make government formation difficult and possibly long. Nonetheless, Gemayel believed it crucial that March 14 stand together against any opposition calls for a blocking third in the new cabinet. He pointed to the impasse that reigned in the previous cabinet, and said March 14 needed to create a government that can function effectively. 3. (C) Gemayel worried that some of his March 14 allies would tend toward being too “docile” in a dialogue with Hizballah, and he stressed it was important for March 14 not to compromise its principles. He felt March 14 decision-making would be more productive if it were run by a directorate of its party leaders, rather than through the intermediary of a March 14 secretariat. With the secretariat out of the way, said Gemayel, the leadership could determine a joint path to take in any dialogue with Hizballah. He was not certain March 14’s strong showing in the elections would tame March 14 Druze leader Walid Jumblatt’s desire to engage more with Hizballah, but stressed that Kataeb would not compromise on the issue of the blocking third. 4, (C) Gemayel complained that in past discussions with Hizballah, March 14 leaders had danced around issues, using vague language that Hizballah could interpret in a variety of ways. It is imperative to be clear on what we stand for, he explained, and to ask for clarification from Hizballah on its definition of certain concepts, such as allegiance (“is Hizballah’s allegiance with Lebanon or with Iran?”) and sovereignty, ideas at the heart of national identity. Gemayel was emphatic that these issues should be ironed out before forming a government, even if the process takes longer. He suggested that if things dragged out longer than expected, perhaps the President could put in place an interim technocratic government, as Gemayel himself had done when he was president during the civil war. NATIONAL DIALOGUE: WHO SHOULD PARTICIPATE? 5. (C) Gemayel believed participants in the National Dialogue following the elections should be chosen according to the criteria established by Speaker Nabih Berri in 2006. All blocs with four or more seats in parliament should send a representative, with the president appointing representatives of confessional groups not otherwise represented at the dialogue table. (Note: Gemayel participated in the current version of the dialogue with only two seats in parliament, because he is a former president. His suggestion that representatives should have at least 4 seats to participate would exclude opposition Christian Suleiman Frangieh, whose Marada party won 3 seats. End note.) He argued that March 14 Armenians, who won four seats in these elections, should send their own representative to the dialogue, replacing Tashnaq MP Hagop Pakradounian, whose party won only two seats. He believed Michel Pharaon, the re-elected Greek Catholic MP from Beirut I, should replace Elie Skaff, who lost his race in Zahle. 6. (C) Gemayel said Berri enjoyed wide support for his candidacy to remain parliament speaker, and noted that both Hizballah and Jumblatt had expressed their intention to vote for him. He believed Saad Hariri would also have his bloc — the largest in parliament — vote for Berri. That said, Gemayel thought it a good idea to start floating names of other Shia as possible candidates, from March 14 Beirut III MP Ghazi Youssef or new Zahle MP Okab Sakr, to put Berri on notice that there were other options available. He assessed such as March 14 should call Berri to task for his behavior during the last parliament, when he shut down parliament operations for over a year, and set conditions for his re-election. 7. (C) Gemayel disagreed with observers who believe former presidential advisor Nazem Khoury’s defeat in the parliamentary race in Jbeil weakened President Sleiman. He saw Khoury’s loss as a result of his lack of charisma, as well as his place “stuck between the two camps.” The President should not be blamed, believed Gemayel, because he remained neutral and did not intervene on Khoury’s behalf. (Comment: Some contacts have told us Sleiman made attempts to drum up for support for Khoury in the final days of campaigning through is army contacts in Jbeil, which may have backfired. Khoury’s victorious opponent from the opposition complained strongly to us about the President’s interference. End comment.) Gemayel added that Sleiman was never a true political figure in Jbeil, so the political loss should not hurt his stature. “He’s a military man, not a regional leader. 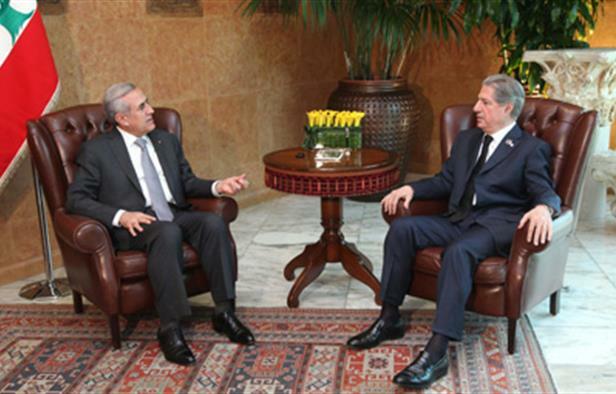 He is just from there,” said Gemayel. 8. (C) Gemayel spoke at length on how his party’s winning five seats in the new parliament — after having two MPs in the previous parliament, both of whom were assassinated — placed Kataeb back at the center of Lebanese politics. He said his candidates had worked hard to win, and he believed that his young MPs (his son Sami Gemayel and his nephew Nadeem Gemayel) would bring youth to his party, which had a long history in Lebanese politics. “We have always been moderators in Lebanon, and protectors of Lebanese sovereignty,” he said. Posted in Amine Gemayel, Michel Sleiman, Politics, Presidential Elections, The WikiLebanon Files, WikiLeaks on April 29, 2015 by Ramez Dagher.